​Whether you're a monthly member, a student, or work elsewhere and just glaze or fire in our kilns, Firestick's 1,000 sq. foot studio and grounds provide everything needed for potters to create, collaborate, learn, perfect their craft, and a gallery to sell their work. Members, students and firing and/or glazing clients may come and go anytime during open hours. Knowledgeable staff is on hand to be of assistance when needed. 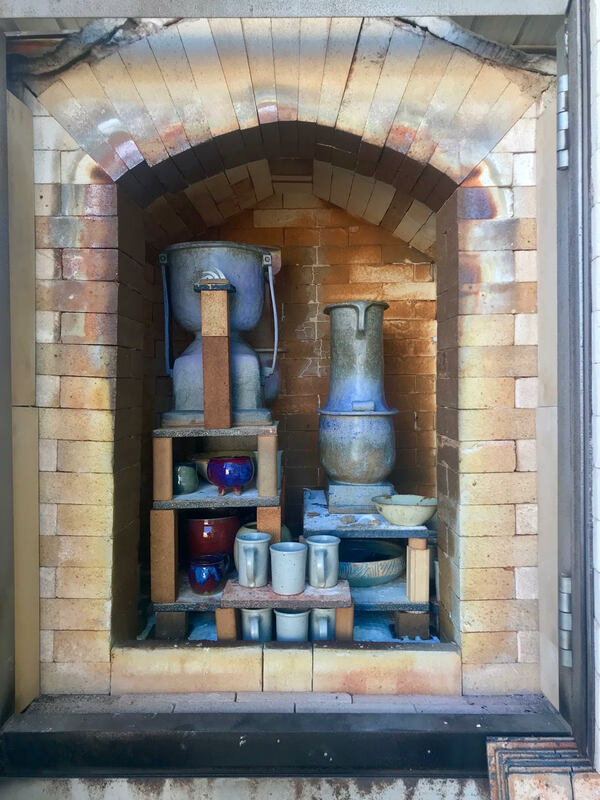 ​The air conditioned studio has fourteen potters' wheels (between the main studio and the classroom), a hand building area, and an outdoor glaze room and spray booth. Member's wares are bisque and glaze fired for them in our kilns approximately once each week. Monthly membership provides unlimited access to the studio, including wheels, the hand-building station, equipment, glazes, firing and staff support. One month membership dues are $135 per month. Your first bag of clay is included with your initial membership. For work done in the studio, clay is generally purchased from Firestick. We carry a variety of cone 10 clays and can special order clay bodies upon request. Use of several dozen glazes is included with studio membership and classes. For others, glazing will be charged by the hour at $8/hour. Potters may always convert to membership at $135 per month for unlimited access. Most firing is reduction, cone 10. Oxidation firing, cone 5-6, and cone 06 are available by request. Raku and pit firing are also available by arrangement. Firing is included with monthly membership, though for commercial potters an overage charge may be applied.